There are not many hotels without swimming pool these days, but none as special as the San Alfonso del Mar Resort, an hour's drive from Valparaiso, Chile, which boasts of having the world's largest swimming pool. It’s about 120 kilometers west of Santiago on the Pacific coast. 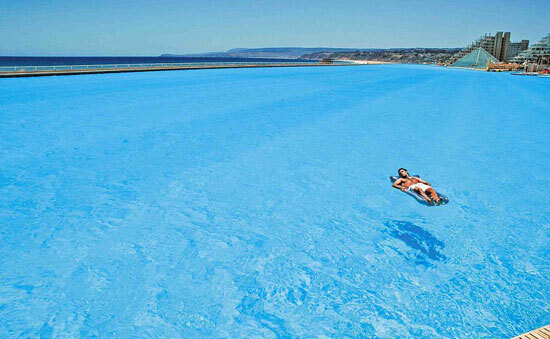 Swimming pool at San Alfonso del Mar Resort is more than a 1.5 km long, and it has an area of ​​eight hectares which contains approximately 250 million liters of water, and it feels like you are being transplanted into the Caribbean Sea. It's big enough for kayaking, sailing, even scuba diving without disturbing currents or terrible cold splashes. And if you not in the mood for calm waters, then you can jump only few meters away into the Pacific Ocean. In the winter time or on rainy days you can easily slip under the swimming pool glass pyramid area where you can even enjoy in heated sandy beach. 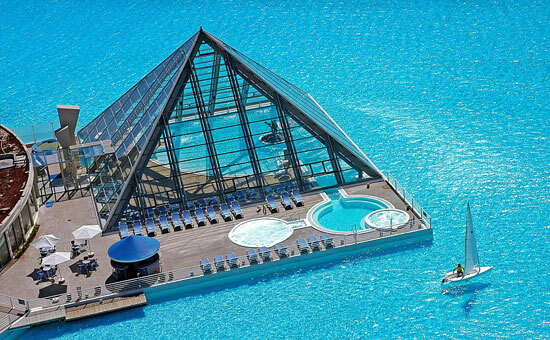 Sure, many hotels have amazing swimming pools, like the Singapore’s Marina Bay Sands, but this magnificent swimming pool in Chile is work of art. 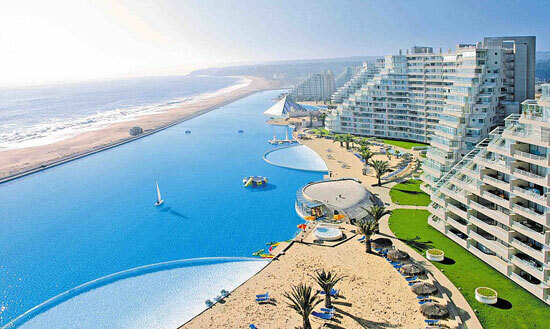 Not even one outdoor swimming pool can compete with the San Alfonso del Mar swimming pool. It is set along the mesmerizing Pacific coastline, and it is larger that 25 Olympic-size swimming pools. The creator of this amazing pool, Crystal Lagoons, claims that this swimming pool is at least six times bigger than closest competitor. The Orthlieb in Morocco is on the second. The pool water is extracted directly from the sea by following a process of globally unique oxygenation called oxygen saturation pressure. This will get that color and crystalline so spectacular that combines with the temperature, which is always between 22 and 26 degrees. Furthermore, this swimming pool holds Guinness World Record for the world’s deepest swimming pool ever made, so if you are in the mood for diving, the best thing is to bring some goggles. Estimated maintenance costs are around $3 million dollars annually. It uses water from the ocean with special controlled filtration system. 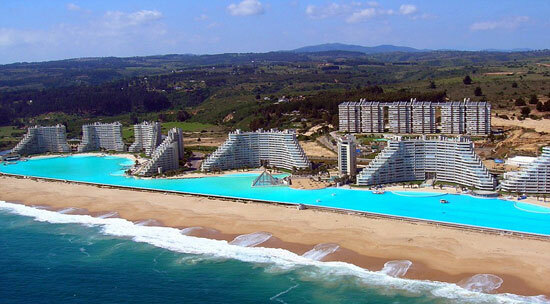 It contains 66 million gallons of sea water. The pool opened in December 2006. It took nearly five years of construction work to build such an amazing object like this one. 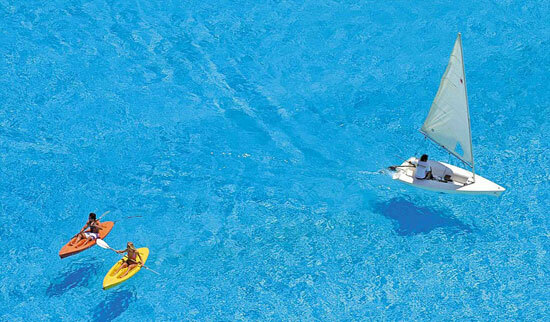 To get the idea of the gigantic size of the pool we note that hotel guests can use small boats to navigate its waters. They can also go diving, because of its 35 meters deepest end. To swim across this swimming pool means to take swimming marathon. Because of its length not many people can swim it in one try. That means if the swimmer Cesar Cielo, who has the world record for the 50m freestyle with 20 "91, decided to cover the entire route at once, and not get tired, he will need about seven minutes to do it.